Have you seen the kids shivering and almost freezing on a stage when they do public speaking? Yes. Public speaking makes the children extremely nervous. Even the successful and famous personalities may find it difficult to address a crowd. Every parent wants their child to excel in every activity. Public speaking is a part and parcel of life. At some of time, every child needs to present him or herself before a set of audience. While doing public speaking, getting cold feet on the stage is normal, but preparing and training the kids helps overcoming the fear. Here are a few tips to train your child for public speaking in advance. Remember, without sufficient proficiency or adequate knowledge about any language, it is impossible to communicate. Make your child gain the proficiency in the languages as a part of communication development. You can easily find the difference between giving a speech in a proficient language and a foreign language. Focus on developing language proficiency, which in turn improves the communication. Don’t make everything very academic. Even the academics can be converted into fun learning. Develop your child to excel in public speaking with fun activities. Get a group of children, preferably in the same age group. Give them or ask them to pick random words. Ask them to speak a few sentences about the respective word. Alternatively, give a word and ask the children to form sentences using the respective word. For instance, Rain. Encouraging communication with others will surely help the child get rid of the fear. For instance, having a conversation with a shop owner in a mall will encourage the kid to have good communication. Talking with neighbors, talking over phone etc, also will lead to a good communication skill. As mentioned earlier, good communication skills eases public speaking. Go for a drive. Ask the child to observe the important things he or she saw. You can then indirectly encourage the child to talk about the drive, the interesting things he or she observed, etc. 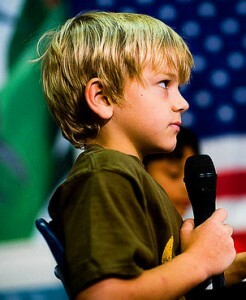 Here comes the usage of technology to develop public speaking skills in your child. You can play the videos of children and even some elders who fearlessly address a crowd. Besides, you can also record the speech given by your child at home and watch it again and again. It will help correcting the mistakes. Just like creating a fun activity, you can also conduct a mock show for children. Every child needs some audience to do the mock show. Arrange for audience; let the child speak in front of the small crowd. This will reduce the fear to certain extent. Don’t rush until the last-minute to prepare your child. Don’t punish or threaten your child when they are not performing well! Don’t rush! Wait with patience and offer your support.